Though Frank (Bruce Willis) and Sarah (Mary-Louise Parker) are attempting to live a life of normalcy by playing everything safe, both of them are not exactly happy with where their relationship is heading. Sarah wants a bit of adventure and Frank has not killed anybody in months. It is most opportune that Marvin (John Malkovich) appears at a Costco aisle and informs Frank that an international ruckus is about to occur. It involves Nightingale, a project they had been involved in back in ’79. Sarah is thrilled to join the elite CIA operatives but Frank would rather have her stay in a safe house. Based on the screenplay by Jon and Erich Hoeber, “Red 2” accomplishes very little despite its characters gallivanting across the world while being hunted by assassins. While it retains some of the charm of the predecessor, the story needs to be cleaned up a bit. Perhaps it would have been better if one less city was visited or two supporting characters were written out. Make room for more or extended friendly banters or show more serious moments to suggest there is something more to the characters than being good at wielding weapons. Since it fails to go behind its skeletal framework, the twists and turns end up disorganized and unfocused rather than being genuinely surprising. The revolving doors of several characters’ loyalties grate the nerves. Since it occurs too often, every time our protagonists are pushed to a corner, it becomes near impossible to feel like they are in any sort of real danger. While light entertainment is the film’s main purpose, changing the tone once in a while would have done it good—especially since it is a sequel and many of us already know what to expect. Its unwillingness to take a risk or try something new is a problem. 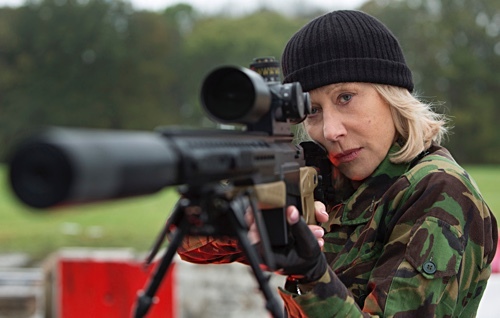 I still adored watching Helen Mirren fire guns and beat men into unconsciousness. She does it with so much verve and charisma. She commits to the character without being cartoonish. The right decision would have been to give her character, Victoria, and Ivan (Brian Cox) more substance. The older couple could have been an interesting contrast to Sarah and Frank—which feels too much like two teenagers falling in love or what they consider to be love. We get only a glimpse of the potential sounding board and it is played too cute. The chases are visually stimulating but standard as a whole. On foot, guns are used too often but there is an entertaining sequence involving Frank being stuck in a file room. Though using a gun from an enemy becomes available eventually, he becomes resourceful in disarming those who wish to capture him. “Red 2” is an unnecessary but harmless sequel. It offers nothing special but it is nice to see seasoned performers clearly enjoying themselves. Anthony Hopkins, playing a patient in a mental institution, stands out because he does not create a character around the lightness of the material. Bailey has his share of quirks but he is not defined by them. Nice review. It’s just a huge step down from the first. A movie that already wasn’t all that great to begin with.